Try your hand at trout fishing with one of our expeditions to the Big Hole River. The serenity of the area and the plethora of fish give you the chance to enjoy a nice, relaxing excursion away from the hustle and bustle of your daily life. 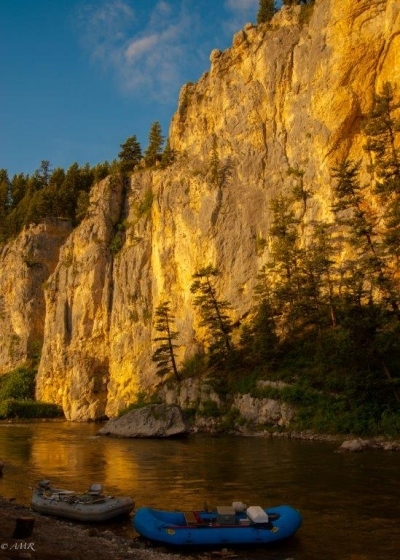 Framed by tall, beautiful cliffs and the serenity of the wilderness, this kind of fly-fishing trip helps you enjoy the best of being one with nature. If you want to branch out on your fish options, you might want to try out fly-fishing trip to the Madison River. With more than just trout residing in this river, this expedition offers novice and experienced fishermen and women a way to cater to their outdoorsy sides. This river trip is close to the lodge, which means you do not have to spend a lot of time traveling to get to your optimal fishing spot. Give yourself the opportunity to catch some of the best trout in the country with an expedition to Beaverhead River. When you need to take a break from fishing, you can explore the shoreline and see some of the other local wildlife in its natural habitat. These Montana fly fishing trips put you right in the center of some of America’s most amazing natural landscapes so you can truly experience everything the country has to offer.